This fall I finally decided to hang up a log that we purchased at a birding store a while ago. 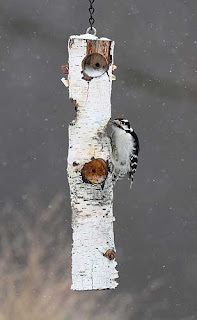 It has several cut-out holes to stash in food for woodpeckers and chickadees. I put some extra crunchy peanut butter in the holes and didn’t have to wait long for takers. Downy and hairy woodpeckers love it and I can’t refill it fast enough for them. It seems to be even more popular than the suet cake we put out. Since winter has arrived here in western Pennsylvania with freezing temperatures and snow flurries it is particularly important to provide birds with the fuel they need to survive in this weather. Peanut butter or suet are just the ticket because of their nutritious content. You can also place nuts in the holes, but only if it isn’t windy. Now sit back and enjoy the show from the warmth of your house.